Many people search pieces of information about when is the best schedule to go to Iceland. Whether every month or every season is always the right time for your departure? Actually, it's easy to decide. There are two things you need to know. First is what is your main goal and the second is how about your budget. Yes, that's enough. By focusing on these two things, you can find a good time for your arrival in Iceland. While the shoulder and low can be classified in the offseason period. Maybe the off-season is your main choice to see Iceland for a certain of goals which are listed under. But based on what activities you want to do and visit in Iceland, the next period of the year is a better chance to make a good plan to visit Iceland for you personally. Did you know that the busiest time for a vacation to Iceland in the low season is November to February? Because it is increasingly popular from time to time, the cost of traveling there can also be more expensive than what you thought. Summer, you will experience 24 hours of non-stop daylight in Iceland. But in terms of cost, this is a plan that must be avoided by budget travelers. The months of this period begin from March to May and then continued from September to October. This season is a good choice for those who want to save money, expect a calm atmosphere, and other things. So what about offseason? This Iceland season run from September to April as a combination of shoulder and low seasons. Therefore, this can be the best choice to come to Iceland. What do You Want When You Come to Iceland? Now let's see what is in your plan. Most people come to Iceland for a vacation. We assume you also thereby. 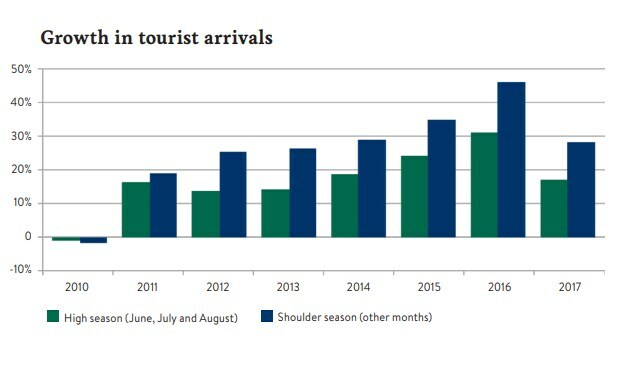 But before we talk further, you can see the trend chart of tourist visits to Iceland below. When we look at the graph above, from June to August the number of visitors is always high. Yes, you see a higher percentage of shoulder seasons (other months), but that is the total number other than those three months. Actually, what happens in the high seasons so that it makes a lot of tourists come to Iceland? Of course, this is not without reason. Summer is the most crowded season in Iceland. You can say it with the terms high seasons or peak times. Because these months are the most popular time for tourists to come here. The effect is the traffic of vehicles on the roads is more than usual. Tourist destinations like hot springs are always crowded. Also, more hikers have fun. Do you think that summer weather in Iceland will always be bright? Well, cold weather in the country fluctuates quickly. During that season bad weather can also occur such as storms or strong winds. So don't be surprised because you can also experience four seasons in one day. Weather forecasts are difficult to predict. Actually, each season has its own advantages and disadvantages. So they all complement each other. A sunny day throughout the day is one of the advantages of summer in Iceland. This is where you can see the midnight sun. Or maybe you can do other, more exciting activities like midnight trip. But this season you can't see the famous northern lights. In fact, this is the biggest downside for summer in Iceland. Not only that, travel and accommodation prices can rise dramatically. Tourists usually have booked ahead of time for their vacation plans. So, if you want to come in the summer, you should plan your Iceland travel carefully. You can record your vacation destination, research transportation tickets, hotel accommodation and so on. After that, you can decide your choice. You can have more time and get what you want. If you don't mind the crowd then you can consider the summer. You must be willing to share spots attraction with many other tourists. Or to avoid it, you can plan to go to places that are less popular. As a guide, here are some activities you can do in the summertime in Iceland. Many tourists put on swimming activities at the geothermal pond in their vacation plans. This is very popular. Do you know if the capital has at least nine swimming pools? One of the favorites is Laugardalslaug. But if you speak throughout Iceland, there are hundreds of them. Even swimming pools in rural areas have amazing mountain views. What is most exciting is that you can sit back and chat with family, friends, or even new people while soaking in a natural hot pool. Hot springs have become part of Icelandic culture and contribute to improving the social life and welfare of the surrounding population. In Reykjavik, these pools can be visited throughout the year. Many hot spring points are hidden or even missed by tourists. Geothermal activity beneath the surface of the lava heats the springs. You can say a good time to visit is when the number of tourists decreases. In September or early October, you can find access through mountain roads. If you want to visit the Blue Lagoon as a big and famous natural spa in the summer, get ready to meet other crowds of tourists. Every year about hundreds of thousands of people gather here. You can consider visiting in the off-season or shoulder seasons. You can experience a better atmosphere and calm. In the summertime, one of the best activities you can do is explore the nature of Iceland. You can go to a waterfall, climb a mountain, or see hot springs and soak while enjoying the endless view. If you are a photographer or tourist who does a self-drive tour, you can drive a car without worrying about being blocked by snow or ice. Maybe every five or ten minutes you want to get out of the car and take pictures of objects that are hard to find anywhere other than Iceland. Every second here is very meaningful. Golden Circle and South Coast have always been the most common destinations for self-drives in a day. Some other tourist attractions that we recommend and you can go from Reykjavik are Hvalfjordur fjord, Snæfellsnes Peninsula, and Reykjanes. If you want to see Iceland green in total, summer is the right time. In other months like April or May and September or October, Iceland will also become green and brown. Camping in the summer like July or August can give you lots of benefits. In these months the temperature is quite warm at around 10-15 ° C. Even there are times higher than that range. By camping, you can have a more flexible time and save money. The main reason for most tourists is that they feel they are always close to nature. That is why this activity is never empty of enthusiasts. But because Iceland's weather can become unstable, always bring equipment such as cold-resistant and water-resistant jackets. You will realize how extraordinary this seems to take advantage of your own Icelandic adventure. Not only observe and admire many beautiful tourist spots but sleep right in the activity and have fun in the natural beauty all day and in the morning. 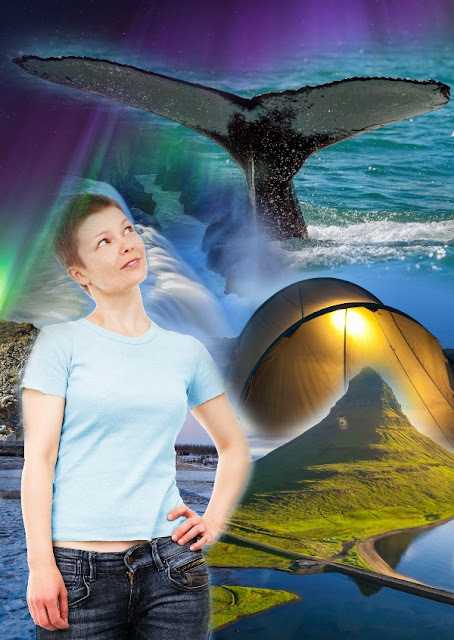 Did you know that camping in Iceland provides you with an exceptional perspective on the natural character around you? Starting from a small tent you might hear the rustling of the grass in the wind. Or you feel peaceful when you hear the roaring waterfall just outside your tent. Maybe you will smell fresh mulch that is used to nourish nearby areas. Always make sure that your camp and vehicle are at the designated camping ground. Visiting glaciers is not just an activity for winter in Iceland. Even though you can do it in the summer with warmer and brighter weather. Some of the activities you can do are climbing icebergs, hiking glaciers, and snowmobiling. You should do it with a professional guide or an official and organized tour guide. Summer can be a great time to explore glaciers. Always be careful when exploring it. Glaciers can be dangerous for people who are careless and don't care about their own safety. We believe that Vestmannaeyjar is one of the most beautiful regions in Iceland. At this time the Westman Islands have attracted thousands of people every year because of various reasons. Many of them were curious and looked at the Eldborg crater and found more information about the deep eruption at the Eldheimar Museum. Meanwhile, other people came to witness the extraordinary natural landscape. Puffin is also one of the main attractions here. This island is big home to ten thousand puffin colonies that nest from May to September in Iceland. Most of them came to Westman Island than in other areas. At least eight to ten million puffins are in Iceland in the summer. You can read a photography guide first to get perfect pictures of Puffin. Whale watching is another major reason to come in Iceland's warmest season. Because at that time you can find lots of whales swimming around the coast of Iceland. June to July is the busiest whale watching month. If you want to see more fish species you can come to northern Iceland. There you can see dolphins, minkes, and humpbacks, also blue whales. The fish swim through the Atlantic Ocean from May to August. You can even see humpbacks until the end of the year. During the first half of the season, you can see orcas along the Snaefellsnes peninsula in Western Iceland. Each place offers different views when watching whales. They give different sensations. This attraction can be found in Reykjavik and almost all the coastal cities of Iceland. Summer is the peak of watching puffins and whales. This activity can be started normally from April to September. Although seeing a whale can be done throughout the year, but the greatest opportunity to see the best is in the peak season. Reykjavik and other small cities throughout the country celebrate summer with music. This has become a tradition for Icelandic people. Dancing, drinking, and camping with the people you love make the atmosphere more festive. Since its first organization in 2104, Secret Solstice has grown larger. The biggest music festival is always held in mid-June. The audience can celebrate from starting midnight sun before dawn with joy. This season, nightlife in Reykjavik is extraordinary. Where parties can take place on the streets. Nightclubs are closed around 4:30 am from June to July. Icelanders like to party either in summer or winter. Iceland in the months of the fall season is awash with interesting color. You will see the National park's landscapes are bathed in multiple colors interspersed with spots of massive green moss throughout the lava activity areas which is most lively just before the winter arrives. But, there's still enough daylight time for huge summer pursuits except temperature points are somewhat lower and you will see if there are fewer travelers with reduced trip costs. Besides that, in fall you can still see the amazing northern lights or aurora borealis from the middle of November onwards to the next months. As an important tip for you, to get the best of all you will have to hunt it on late into the night or another option is start from the very early morning. This season is grouped as the offseason. Therefore, you can find this is a great moment to observe the nature without any crowds interference. The prices of accommodations and transportations. This is a good opportunity for you to watch the great Iceland Airwaves music festival. This sensational event generally takes place in November on each year. So, if you intend to get the rock atmosphere as a variation to your usual trips, then the best time to visit Iceland is in the late fall. If your goal is to see Puffin's colonies, April is the right time. They began to come to nest at that time. There are lots of locations in Iceland where you can see Puffins. You can get photography map and take photos while watching the beautiful birds freely in the spring. You should have prepared everything before your scheduled departure. But this season you might not experience snow. Actually, this situation depends on the time of year of your trip to Iceland. Some people may have never experienced snow in their place of origin. They come with that goal in the winter. In this season you can also find different holiday sensations from other seasons. So if you want something unique, come in this period. During winter, temperatures in North Iceland can reach extreme points at -30 °C. Especially, December until February is the most frozen. Use maximum equipment to protect your body from cold and snow winds. Northern lights can be seen well along the equinoxes, you also can go for northern lights tour. At the end of November to January, there is very little daylight time. This is a good opportunity for aurora borealis seekers. But the adventure fans can say this seems annoying. The Best or Worst Time to Visit Iceland? Good or bad when your arrival in Iceland depends on your budget and your wishes. For example, if you have a limited budget, coming to Iceland in high season is a less rational idea. Or when you decide to pick summer as a time to see the northern lights. So actually the best time to come to Iceland is not the same for everyone. They have their own reasons for doing it. The warmest months can also be an inappropriate time if you don't like crowds because tourists are everywhere. Tourist attractions like Golden Circle road trip, soaking in Blue Lagoon, exploring South Coast, or Jökulsárlón will be crowded. To avoid this you can go to remote areas as an alternative such as East Iceland or Westfjords. The area also has waterfalls, beautiful spots, and landscapes such as other tourist attractions around Reykjavik. So, focus on your budget and what you want to do. Research travel costs wisely and determines your departure schedule. Remember that every season in Iceland offers its own uniqueness. There is always something you can tell when you return home with valuable experience. So the answer to this question is too complex. Traveling on off-seasons can give you an advantage, from the low prices of transportation tickets, the calm atmosphere due to the small number of tourists, and also this is the right time for photographers to take action. But in these months sometimes a lot of minor roads are closed due to ice or snow. You also need to be extra careful when driving on snowy roads. Budget is always a crucial factor when it comes to tourist travel. If you plan to come to Iceland on a budget then think again if you want to come in the summer. Maybe you are looking for the cheapest time to go to Iceland. Try to consider visiting from November to February to save more your money. This is indeed the coldest and darkest months. But also you have the opportunity to get discounts on winter accommodation easily. The increasing tourism sector in Iceland makes the cost difference between high season and other seasons quite significant. Try to observe the price of airline tickets from airlines such as Icelandair and Wow Air. If you still want to take a flight at peak times from the U.S, then be prepared to pay for a ticket with about a 5-fold price compared to off and shoulder seasons.